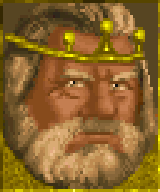 King Eadwyre (born in 3E 340) was the ruler of Wayrest in the late Fourth and early Fifth Centuries of the Third Era. He was the husband of Queen Carolyna with whom he had a daughter, Elysana. Later in life, Eadwyre wed the Dunmer Queen Barenziah, and became stepfather to her children, Helseth and Morgiah. Eadwyre became King of Wayrest in the late Fourth Century of the Third Era. Carolyna was his queen, and together the couple had one child, the Princess Elysana. In 3E 391, Eadwyre was on a visit to the Imperial City. One night, the spirit of the mage Ria Silmane appeared to him in a dream with a desperate tale: that Imperial Battlemage Jagar Tharn, to whom she was apprenticed, had come to possess a powerful artifact—the Staff of Chaos. Tharn used the Staff to imprison Emperor Uriel Septim VII in an alternate dimension. Furthermore, Tharn had been magically posing as the emperor for the past two years. Silmane found out, and was murdered when she tried to warn the Elder Council. Eadwyre came to believe the story, but doing something about it would require help. As it happened, Queen Barenziah of Mournhold had come to the Imperial City for an audience with the emperor. The king was an acquaintance of her husband, General Symmachus, who figured prominently in Eadwyre's family's legends. Eadwyre called upon Barenziah and voiced his suspicions that the emperor was an impostor—suspicions which Barenziah confirmed. Tragically, word had arrived that day that Symmachus was killed in a revolt; Barenziah and her children were now exiles. Nevertheless, a plan was soon hatched; rescuing the true emperor, as well as protecting the Dunmer royals, would require Barenziah to get close to the pretender. The two had once been lovers, and she still had his eye. It would not be difficult, but it would be dangerous; Eadwyre swore to protect the children should anything happen to the queen. The key to defeating Jagar Tharn was the Staff of Chaos, which had been hidden away. Ria contacted an old friend, who agreed to be the Champion of their cause. Unfortunately, this ally was locked away in the Imperial Dungeons. A copied key and a bribed guard solved this problem easily enough, but locating the Staff proved more difficult; Tharn had split it into eight pieces and hidden them all across Tamriel. Over the next several months, Barenziah discovered these hiding places, which Eadwyre relayed to Ria, who informed their Champion. Once the final location was discovered, Eadwyre secreted Barenziah and her children out of the Imperial City, one step ahead of Jagar Tharn's minions, and brought them to the safety of Wayrest. Queen Carolyna died in 3E 392. Eadwyre and Barenziah had grown close during their time together, and before long the pair were wed. Thanks to their efforts, the Champion was able to defeat Jagar Tharn and rescue the true emperor in 3E 399. For a while at least, peace had returned. Before long, the peace was disrupted again. At some point around 3E 401, the Totem of Tiber Septim was rediscovered in the Iliac Bay region. According to legend, this artifact would allow its bearer to control Numidium, the colossal golem once used by Tiber Septim to conquer all Tamriel. The Totem changed hands several times over the next few years, until it was recovered by an unknown Agent of the Blades. Curiously, the Totem itself spoke to the Agent, demanding to be given to someone of royal blood. This touched off a furious bidding war among the major powers in the region. King Eadwyre himself had long searched for the Totem. With the power of Numidium, Wayrest could crush its enemies (notably, Daggerfall and Sentinel) and become the dominant power in the region, and no one—not even the Empire—could stop them. The king offered the Agent a handsome reward in exchange for the artifact. However, upon being presented with the Totem, Eadwyre's "reward" was simply to order his battlemages to kill the Agent, who had no recourse but to flee. The exact details surrounding this time are unclear, but somehow Wayrest was but one of seven factions to gain possession of the Totem—simultaneously. After the Agent completed a final task, Numidium was ready to be activated once again. And on the 10th of Frostfall, 3E 417, each bearer of the Totem did so to their own ends. Time itself was distorted, and several days seemingly merged into one—an event known as the Warp in the West. When the dust had settled, Wayrest was one of only four political divisions remaining in the Iliac Bay. It's borders now stretched as far as the (former) lands of Anticlere and Gavaudon. King Eadwyre died some time in the following fifteen years. Ironically, though his part in the Warp in the West helped cause unimaginable death and destruction around the Iliac Bay, it also ushered in a new era of peace and stability. 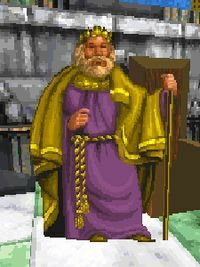 For game-specific information about King Eadwyre, see the Daggerfall article.